Although this is a popular game that kids and adults play at Halloween, it actually started as a British courting ritual. Every male was assigned an apple and then the young eligible ladies would bob for them, hoping to grab the apple of their beloved. While trees add value to any property or landscape, how well they work for you depends on choosing the right tree for its intended purpose. Do you want shade, privacy or color? Once we know what it’s for, we can figure out the best tree for the job. 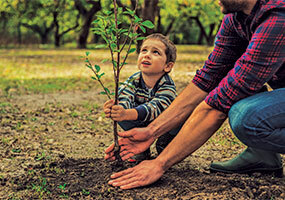 Before planting a small, young tree, find out how large it will be when full size. Giving trees enough room to expand their roots and branches will mean less care later. Plant most trees ten feet or more from building foundations, depending on the shape and final size of the tree. Don’t plant tall varieties of trees under overhead lines. Most roots will be in the top 18 inches of soil and can spread up to 2-3 times further than the branches. They have the power to upturn patios and sidewalks if planted too close. Planning first will improve the results later! 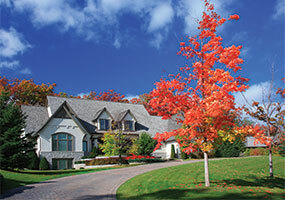 For questions about trees that are right for your needs or best suited to our local climate, give us a call. We look forward to helping you plan and plant ahead. Nature slows down this time of year – this goes for your lawn as well. 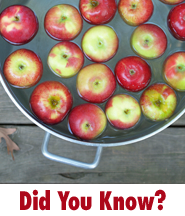 As your lawn prepares for winter, giving it a good fall feeding is one of the best things that you can do for it. As days grow shorter, top growth among the grass blades slows down – but this apparent slow down is only half the story. Though there is not much going on above ground, in the fall your lawn turns its focus towards developing its root systems. Robust and healthy roots make it easier for your turf to store up valuable nutrients for the coming winter. Lawns that are prepared for the winter are eager to burst back to life the following spring. 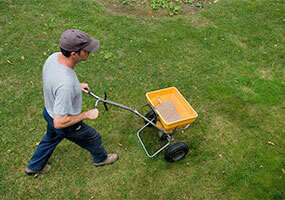 Fall fertilization gives your lawn a boost at an ideal time. Feeding your lawn now gives it a leg up for the rest of the year and for years to come. Things may be winding down around your lawn, but don’t forget to give it a good meal before bedding it down for the winter.